The common muskrat (Ondatra zibethicus), are found in all states except Florida. This semiaquatic mammal is a medium-sized rodent native to West Virginia and throughout most of North America. The muskrat is found in both freshwater and brackish impoundments and is a very successful animal over a wide range of temperatures and habitats. It plays an important role in nature and is a resource of food and fur for humans and is a resource of food for many other animals including eagles, owls, hawks, mink, foxes, coyotes, bobcats, bears, snakes, otters, and etc. An adult muskrat is one to two feet long, almost half of that tail and the tail drags on the ground when they walk, they weighs about two to three pounds. That is about the size of a wild rabbit. Muskrats are covered with soft brown short, thick layer of insulating fur (except tail and feet) with the belly a bit lighter, head is large and has small eyes and ears. It has short legs and small front paws. The tail is covered with scales rather than hair and the body is laterally compressed. 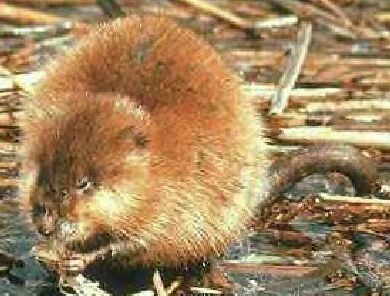 Muskrats are much smaller than beavers (Castor canadensis), and in some states muskrat mistaken for nutria, (Myocastor coypus), when sharing the same habitat. Muskrats spend much of their time in the water and are well suited for their semiaquatic life, both in and out of water. They can go onward or backward and swim underwater for long periods of time and they will travel great distances underwater when escaping from predators. They can close off their ears to keep the water out. 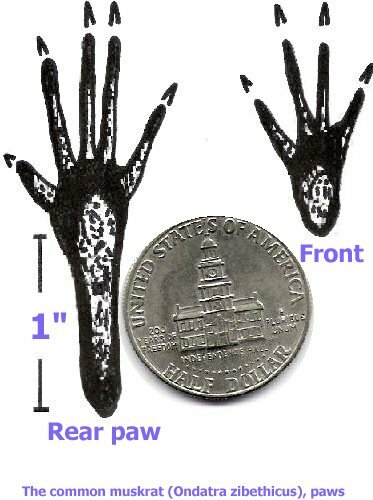 Their rear paw five toes and the front paw 4 toes, in swimming the muskrat tail is their main means for propelling through a body of water. Muskrats are prolific breeders and raise more than one litter a year with occasionally three litter in favorable conditions and may raise 18 or more young per season. The gestation period of these fairly large rodents is 29 to 30 days. 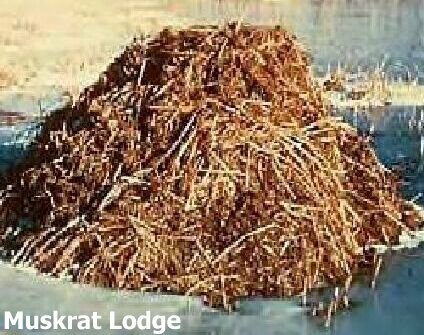 The young rodents, blind and hairless at birth and weigh only about .8 oz, are raised either in a nest within the muskrat lodge or in a den in the bank adjacent to the water with an underwater entrance, they remain in the nest for three or four weeks. Muskrats are primarily nocturnal (active at night), with peak activity occurring near midnight or near dawn and dusk. They do not hibernate or store food for the winter, vegetation make up the biggest part of their diets, but they also eat small animals such as Freshwater Mussels, fish, frogs, and crayfish. They cannot feed under water and do not normally eat while in the water, but climb out on their houses or on feeders, along the shore, on rocks, or on logs or other floating objects to eat.